Bird Walks - Wellesley Conservation Council, Inc. The WCC offers free spring Sunday-morning bird walks beginning the 1st Sunday in May. Beginners and novices are welcome. We explore areas not only in Wellesley but also in nearby towns. It is not uncommon to observe 30 species in their top breeding finery and vocalization! The leader will direct the group to the most promising birding site of the day. Binoculars, guide books, and waterproof footwear are advisable. Except for our Mother's Day trip to Mt. 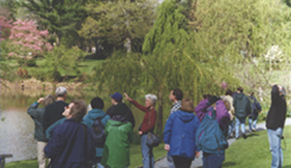 Auburn Cemetery, which meets at 7 a.m., all bird walks commence at 8 a.m. Sundays from the parking lot at the corner of Cameron and Washington Streets (next to the main Library).